"People matter". 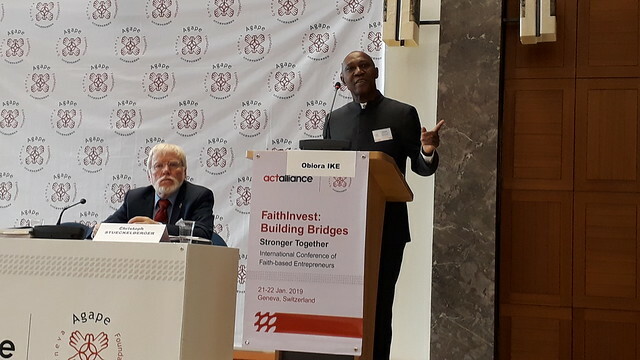 This is how Dr Obiora Ike, Globethics.net Executive Director started his speech at the FaithInvest International Conference for Christian Investors and Development Agencies organised by ActAlliance and AGAPE Foundation in Geneva on 22 January 2019. Dr Ike continued saying that development must be centred on the people and on empowering the poor to participate in their own development. The economy is at the service of humankind, not humankind at the service of the economy. This is why according to Dr Ike faith organisations are key to transformation and to moving towards investments that are guided by ethical principles. People matter. In empowering people we build upon our most valuable resource. For us development must be people centred and the poor empowered to participate in their own development. Dr Ike stated that religious organisations own an important part of the world's assets and investments. According to the Zug Guidelines on the topic of ‘Faith – consistent-investing' compiled by Martin Palmer and Pippa Mose and published in October 2017 by the Alliance of Religions and Conservation, "the faiths own about 8% of the habitable land surface – around about 5% of all commercial forests; run, manage or founded around half of all schools worldwide and in sub-saharan Africa 64% of all schools. The Faiths have more TV and radio stations between them than the whole of the EU and produce more books, newspapers and journals than any other network. They also own an estimated 10% of the world's total financial investment". Religious leaders are often trusted more than those in government or in the non-governmental (NGO) world and they are listened to and followed in ways that almost no other sector or society can hope for. They are local, national and international in understanding and outreach. Through their teachings and practices they manifest the core beliefs and with them the core values of their traditions, using language which is accessible and value filled such as compassion or love or trust. This unparalleled outreach which speaks to norms, behaviours, attitudes and social and political trends, cannot be underestimated. Faith-inspired NGOs carry forward a critical reality – that religious institutions are the oldest social service providers known to humankind. As such, they are the original service deliverers of health, education, nutrition, farming, sanitation and energy – to name but a few. Faith leaders, who are often community leaders as well, can play critical roles as mediators in conflict situations. This political capital, while double-edged (in cases where they may also be stirring the conflict pot), is nevertheless a role that is as old as it is vital to contemporary geo-political dynamics". Faith groups work in some cases to promote social justice and equality, environmental action, concern for the poor, the oppressed and the most marginalised, non-violent resistance and the search for real peace. This is why faith groups can make the United Nations Sustainable Development Goals (SDGs) a reality. Billions of people rise to prayer and worship every day, sustained by such beliefs and practices. This is what makes many lives sustainable. No other institution in the world has and can sustain that capacity for hope, commitment and compassion. To ensure that economic and ethical rationality prevails, it is now generally accepted that the financial sector plays a major role in the workings of a modern economy. Therefore its significance and morality must also be called into question. Repeated financial scams and bank failures have raised justifiable questions about the possible negative effects of the financial sector on productive economy and the well-being of the human person. The financial sector has the strongest impact and relevance when it promotes an economy that serves persons, puts people ahead of profit, reduces gaps that make people dependent and makes the economy serve the human person, not vice versa.